in a poor community in El Salvador. 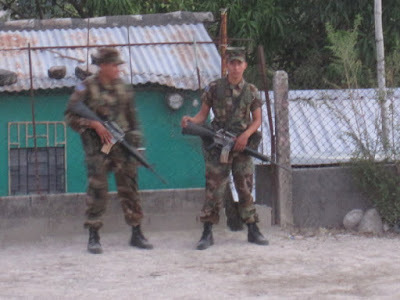 Three local school teachers were murdered in the town of San Juan Opico. A Mexican official who is part of Interpol was attacked in broad daylight in San Salvador by gunmen. The attack left the official wounded and his wife dead. Four members of a family were massacred by suspects using an AK-47 assault rifle.There have also been riots in the prisons over the past week, with three prisoners killed and authorities not in control. The presence of troops in the streets has produced no reduction in the level of homicides or extortions afflicting Salvadorans. With 1063 murders in the first three months of the year, the country averages 12 homicides a day. 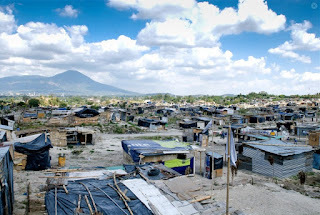 Last week the United Nations Development Program office in El Salvador issued a several hundred page report on the urban slums of El Salvador. It is called the Map of Urban Poverty and Social Exclusion in El Salvador and consists of a narrative volume and a volume which maps the locations of "precarious" living conditions throughout the country. The study focuses on the poorest areas in the urban parts of El Salvador which the report labels Precarious Urban Settlements. (acronym "AUP" for its initials in Spanish). The data in the report is drawn from the 2007 census in El Salvador. It is hoped that the detailed review of the residential living patterns of some of El Salvador's most marginalized citizens will be a tool for government planninng and intervention. I'm back from vacation (one that was extended by a volcano in Iceland) and it's time to get back to regular blogging about El Salvador. While I was gone, I hope you had a chance to check out the stories at Linda's El Salvador Blog. I'll be taking a break from blogging for the next two weeks while I'm on a vacation with limited internet access. In the interim, you may want to check out Linda's El Salvador Blog. It's a new blog which recently appeared with essays about experiencing El Salvador. It's definitely worth a read. For many of us, the thought of being without water is unimaginable. We brush our teeth, wash our dishes and clothes, shower, and drink from the faucet without thinking much about it. It has always been that way and as far as we know, it will continue to flow for us. Here in the community of Rutilio Grande, the water stopped running last week, a scary reality during the end of the dry season when the rivers dry up after 6 months of no rain.